Euan Morton brings his own take to a character who's more than hair and makeup. There's a certain humility to the way Euan Morton thinks about playing Hedwig, the transgender East German rock singer at the center of Hedwig and the Angry Inch. In fact, he gives much of the credit to those who dress him up in the character's distinctive glam ensemble. "I put on the outfit, the makeup, the hair, and people just go, 'Hedwig!'" the Scottish-born actor says during a phone interview from a tour stop in Seattle. "So before you've even said a word, the audience buys that you are that person. There's a lot of the pressure that's taken off of you to do an impersonation; you're given a freedom to interpret in a very different way for people who've already purchased what you're selling." If audiences are ready to make that purchase, it's because this unique story has already been brought to life in iconic ways. Set just after the fall of the Berlin Wall, Hedwig and the Angry Inch places the title character on a nightclub tour in which she's essentially stalking an ex-lover, rock star Tommy Gnosis, and telling her life story including her life behind the Iron Curtain and a botched gender-reassignment operation. The play's creator, John Cameron Mitchell, turned the 1998 off-Broadway show into a cult-favorite 2001 film adaptation; Neil Patrick Harris later won a Tony award for a 2014 Broadway revival. 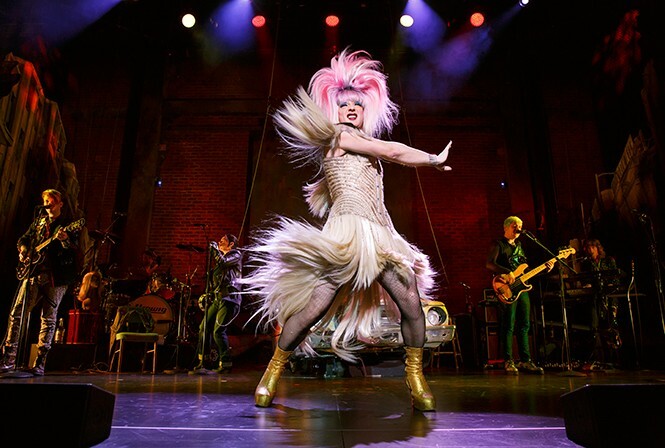 Following in such large footsteps might seem intimidating to an actor, but Morton—who says he's seen the film version, and read the script from the Neil Patrick Harris version—feels that he was given the freedom to make Hedwig his own. "There are certain marks you have to hit, certain things you have to do, and everyone does them the same way in order for the show to work," Morton says. "But when it comes to developing a character ... I was given a lot of freedom. There were certain pointers given that have worked before, and in many cases I did them and they continued to work. On the whole, I never felt like I was trying to keep up with somebody else's interpretation." Morton certainly didn't step into the role without impressive credits of his own. Indeed, he originated the role of another gender-bending musical figure, Boy George, in his Tony-nominated performance in Taboo—another role, he jokingly notes, where putting on familiar makeup and hair gives an actor a head-start. He also believes that the very nature of Hedwig and the Angry Inch makes it the kind of show where an actor has to be ready to take things in their own unique direction. "The audience is a character in this show," Morton says of the premise. "There's no fourth wall. You're talking to them for the entire evening, and in some cases you're forcing them to interact, or they're interacting through their own choice. And that takes on a life of its own. That sort of other character, being the audience, informs very much how the evening is going to go, and makes every evening totally different." The script itself and the songs have changed over the years, in larger and smaller ways, up to and including tweaks that are made based on each individual city where the show plays. It's also a play that was born in the late 1990s—not only a different era in terms of the politics, so close to the dissolution of the former Soviet Union, but a world where Hedwig's representation of a genderqueer character was unique in the media. "I think the world, social ideas have grown," Morton says of the way the story now plays more than 15 years after it was created. "The number of young people that are coming out as gay or transgender or genderqueer or whatever name they give themselves, it's a far greater number [and] people are coming out younger. But [Hedwig is also] talking about a wall as a metaphor for separation; I mean, we've been talking about 'the wall' [in the presidential campaign] for 18 months now. ... It's about the fall of the wall, and the rise of the personal wall, and how to get over them both." The stop that the Hedwig tour makes locally falls during Christmas week, which might be particularly appropriate for a tale that Morton calls "a little, tiny love story," but one that's wrapped up in the kind of big ideas captured in the revisionist mythology of the song "Origin of Love." "It's honestly like the explosion of the Big Bang at the beginning of the show," Morton says, "and the universe just expands from there over 90 minutes. At the end you're looking at the entire knowable universe through music and story. And all of those little stars are the stardust of love. Each little star is the remnant of love in [Hedwig's] life. And with that many stars in the universe, it looks like Christmas lights."